This past year has been an eventful one. For better or for worse, it is coming to an end. Our New Year’s Eve tradition is to have a "Junk Food Dinner" (mostly hors d’oeuvres) and stay up until the ball drops. My tradition on this blog is to look back at some of my favorite posts of the year. Unfortunately, I rang in the New Year with a resurgence of my post-surgery anxiety attacks. I realized that Anxiety Is A Bully. It tries to dictate the rules of engagement to you so that they vastly favor the anxiety and not you. It’s important to fight back, realize what anxiety is doing, and refuse to play by its rules. On a more serious front, the Charlie Hebdo attack led me to wonder about the Freedom To Offend and the Freedom To Be Offended. While it might seem tempting to silence people from saying offensive things, we’ve got to protect their right to offend. If we don’t, then someone else might take offense to something we think is important and silence us. At the same time, people have a right to be offended and to call for there to be consequences. If a politician says something extremely offensive to me, then it’s my right to protest and demand he be removed from office. This doesn’t mean silencing him. It just means balancing two different, yet related rights. It can be tricky to navigate these waters without going too far in either direction, but it’s important that we don’t let ourselves sway too far against the offensive or against those who are offended. Did you know I have a Zazzle store? I didn’t. I posted a parody of "Soft Kitty" from Big Bang Theory and then inspiration struck and I turned it into a T-Shirt. I’m not sure if any have actually sold, but I love coming up with things like this. With a measles epidemic raging, I dove into the subject of vaccines and consequences. My takeaway: Vaccines work. Those who claim they cause autism or contain toxins or are worse than the diseases they prevent are ignorant at best or trying to sell you bunk at worst. Unless you have a medical condition that precludes vaccination (e.g. some allergies or an immune system disorder), everyone should be vaccinated. It’s a simple procedure that will save the lives of not just the vaccinated but of the people who can’t be due to age or medical issues. We spent much of last year playing Minecraft. I’ll admit that I haven’t picked it up much recently, but there have been many updates that my boys have shown me and I might just need to try them out myself. March began with a monumental event. We cancelled cable. Without cable, we joined the ever growing ranks of cord cutters and got our video entertainment from a mixture of Internet-based video services (Netflix, Amazon Prime, Hulu), renting DVDs from our local library, and an OTA antenna. I also have some new equipment that I need to set up which will let me record shows and stream videos to our TV. We’ve been saving money every month and haven’t looked back. We had a touching moment in a local museum. They had an electronic drum set and NHL – who plays percussion in his band – was rocking out to it. A set of headphones he wore kept the sound to himself. A little girl came up to watch him play and NHL offered her his headphones. The little girl was instantly mesmerized by the sounds NHL was producing. Her eyes glazed over as her full attention was given to what her ears were hearing. Then NHL gave her the drumsticks and helped show her how to make the sounds. He willingly gave up a spot at one of his favorite exhibits so that a little girl he didn’t know could discover the wonders of drumming. It’s a little gesture, but I was so proud of him at that moment. During April, we got into some tabletop gaming with Pandemic. We were introduced to it by a family member during Passover and had to get it ourselves. What I love about Pandemic is that everyone works together. There is no one winner or loser. Either everyone wins by curing the diseases or everyone loses as the diseases ravage the world. There was also a big WordPress vulnerability found and as people rushed to update I explained just what the vulnerability meant and how web developers usually tackle this sort of thing. May was a very geeky month. Along with Free Comic Book Day, and palindrome week, Star Wars Day meant we could play some lightsaber games. May also saw JSL turning 8. To wrap up the geekery, California instituting "toilet to tap" led me to wonder just how much water was in the world to drink. It turns out that it’s a lot, but it isn’t an infinite resource. I also wrote about Asperger’s Syndrome and how it affects neurotypical siblings. JSL can be very patient with his brother at times, but he does have his limits and will often crave non-NHL times. In June, I took some lessons from a rose bush – don’t listen to others telling you that you can’t succeed, just do your best and keep at it. I also wrecked havoc with society by inventing instant transportation. Ok, I just wrote about what would happen to society if someone invented it. Given how I think it would turn out, be thankful it’s not here. Thanks to then-newly-running candidate Donald Trump, I explored the true cost of web development. Unfortunately for Trump, you can’t develop a large, complex web application that will be used nation-wide and only pay $3. It simply cannot be done. In July, New Horizons’ impending rendezvous with Pluto made me geek out about how quickly we’d be able to travel around the Earth if we could move at the speeds New Horizons was travelling at. A tweet from The Bloggess inspired me to gather a series of 18 things that I’d tell 18 year old me. Finally, it’s amazing how much you can get attached to a piece of furniture. We finally got rid of our old couch. It was hard to do, but it also was time. The boys got to sit on it one last time as it lay on the curb awaiting pickup. I even let them jump on it – something we never let them do when it was in our living room. In August, I turned 40 years old. Or, as I like to think of it, the 11th anniversary of my 29th birthday. In addition, NHL turned 12. Why won’t he stop growing up? Why?!!! We also began a cruising adventure to celebrate my 40th birthday. In September, I shared a washy washy, happy happy, smiley smiley cruise greeting and described our incredible beach day at Norwegian’s private island. This was also the month of me speed reading. 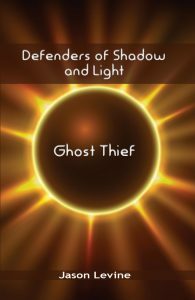 NHL was reading the Percy Jackson series so I decided to read them as well. (I’ve always been a fan of Greek mythology.) I not only tore through the first book, but the entire series (passing where NHL was). Since then, I’ve finished Rick Riordan’s Heroes of Olympus series, his Cain trilogy, and the first book in his Asgard series. I’ve only stopped because I’ve run out of books by him. (Come on, Rick, get book 2 written quickly!) I’ve also read The Bloggess’ Furiously Happy and laughed the whole way through. In October, I wrote a rebuttal to someone who claimed that kids with Autism are better off when they’re bullied. The author actually used the word "perks" to describe the results of bullying. I’d use words like tormenting, paranoia, isolation, loneliness, and hopelessness instead to describe what happens when someone is bullied. If you want to call those "perks" then you have a really warped definition of the word perks. On the video gaming front, I fulfilled a lifelong desire to make Mario video games thanks to Super Mario Maker. After picking 44.5 pounds of apples, I baked apple dishes until we were sick of apples. Finally, I wrote up a guide to help people who wanted to explore cutting cable. In November, I went through some scary Halloween decorations and an even scarier Christmas one. I also gave a peek at what goes on in my head when I try to communicate verbally. It’s battle on many fronts and not one I win every time. December saw our Star Wars excitement build to critical mass. Spoiler free review: The Force Awakens was incredible. I can’t wait to see it again. We also celebrated B’s birthday and I had a mini-mid life crisis thanks to my Imposter Syndrome. Finally, we had some fun with Google Cardboard. It’s been a wonderful year. Here’s hoping that 2016 will be exciting in all the right ways. 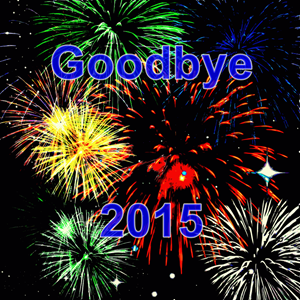 NOTE: The "Goodbye 2015" image above is based on "Fireworks Remix" by keriann3 which is available from OpenClipArt.org.